Marc Anderson shows the tiger muskie he caught at Pineview Reservoir in 2006. The first tiger muskies ever raised in Utah will soon be swimming in six waters in the state. The tigers will be only two to three inches long when they're released. But they won't stay that size for long. Drew Cushing, warm water sport fisheries coordinator for the Division of Wildlife Resources, says the fish should be about 20 inches long a year from now. "And by spring 2013," he says, "most of them will be 30 inches long or longer. Tiger muskie grow fast." You can see just how fast by watching a video of anglers fishing for tiger muskie at Newton Reservoir. The video is available at www.youtube.com/UDWR. Once you arrive at site, scroll through the video choices on the right side of the page until you find the video titled "Chasing Tiger Muskies." Tiger muskies are created by stripping eggs from a female Northern pike and then fertilizing the eggs with milt (sperm) from a male muskie. The result is a sterile fish that doesn't reproduce. Instead of spending its time reproducing, tiger muskie prey on other fish. In the process, the tigers get bigger and bigger. Cushing says many of Utah's tiger muskie waters have plenty of tigers that are more than 40 inches long. "And every year," he says," anglers catch fish that are longer than 50 inches." While the future is bright for tiger muskie fishing in Utah, it wasn't that long ago that biologists and tiger muskie anglers alike were wondering if one of Utah's most unique and thrilling fishing experiences might be gone for good. Tiger muskie were first placed in Utah in the early 1990s when DWR biologists brought tiger muskies into the state from Minnesota. Utah's tiger muskie program went well until 2006. Then, fish disease issues began to crop up in the Midwestern and Eastern states that Utah got its tigers from. As soon as the disease issues emerged, the DWR stopped importing tiger muskies into Utah. But the agency's biologists didn't give up on the state's tiger muskie program. A good population of Northern pike existed in Recapture Reservoir in southeastern Utah. To create their own tiger muskie, all the biologists needed were muskie to cross with the pike. But where would they find muskies that were disease free? "It was a frustrating search that lasted three years," Cushing says. "Just when we thought we had a source that was disease free, another round of disease testing would dash our hopes." Finally, through the help of state fisheries biologists in Nebraska and Minnesota, disease-free sources were found in both states. And soon after those sources were located, another disease-free source was found in South Dakota. "Finally," Cushing says," we were in business." Ponds the DWR constructed at its Lee Kay Public Shooting Range in Salt Lake City soon became home to 100 disease-free muskie that biologists brought into the state. Later, 40 Northern pike, captured by DWR biologists at Recapture Reservoir, joined the muskies at the facility. This spring, 166,000 tiger muskie eggs have hatched or are in the process of hatching at Lee Kay. Cushing says the young fry that have hatched are doing well. "When the fry are stocked in mid-May," Cushing says, "we'll reap the rewards of five years of hard work." 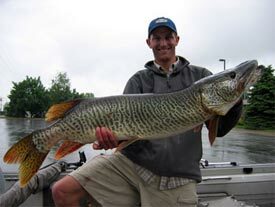 Cushing says tiger muskies grow fast, so most of the two- to three-inch fish should escape other predators in the water. Within a few months, the tiger muskies themselves will be the top predator in the waters in which they're released. A tiger muskie source for other states? Cushing says most of the Western states have started, or would like to start, a tiger muskie fishing program. These states have been watching Utah closely. "If we have extra tigers," Cushing says, "we might be able to supply them to the states that are interested." For more information, call the nearest Division of Wildlife Resources office or the DWR's Salt Lake City office at (801) 538-4700.